In my last post What is Range of Motion (ROM) we discussed ROM and how it is measured. It is something that is interesting to note, as we often assume in Yoga that all joints can move in all directions and degrees in all bodies. I have often heard one “should” get to blah blah in a certain pose. 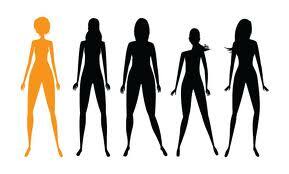 Have you ever considered the length of limbs, torso-to-limb ratio, height, weight, age etc. 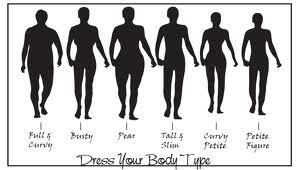 and how that might impact a pose, and everyones ability to be in a shape. That would be akin to saying all women wear the same dress size. And I don’t know about you, but I certainly know that I am Not the same size as a Sports Illustrated or Victoria’s Secret model. Or many of the yoginis I teach! We often say that Yoga is individuated, and yet also say that we “should All be able to have 90 degree arms in chattaranga” , be able to bind our arms around leg/torso in all bound poses, and other myths. As I have continued my own study of anatomy (under the guidance and tutelage of Judith Hanson Lasater, who is a physical therapist and senior yoga teacher), I have discovered my own truths about myself and others. Additionally, I have grown older, had injuries, illnesses and other aspects of life that have changed my view on asana. There are 360 joints in the human body, and joint pain is defined as pain, stiffness, or swelling in or around a joint. There are several types of joints in the human body. • Ball and Socket Joints – a wide range of rotation and movement. The shoulder and hip are ball and socket joints. • Condyloid Joints – movement but no rotation. There are condyloid joints in the jaw and fingers. • Gliding Joints – bones glide past each other. There are gliding joints in the ankles, wrists and spine. • Hinge Joints – movement like a door hinge. The knee and ulna part of the elbow are hinge joints. • Pivot Joints – allow bones to spin and twist around other bones. There are pivot joints in the neck and the radius part of the elbow. • Saddle Joints – back and forth and side to side motion but limited rotation. There is a saddle joint in the thumb. So, after hunting around the web, I have found some medical standards for “average and normal” ROM (Range of Motion) in major joints of the human body. Here it is, and it may surprise you! HINGE MOTION – open at least one inch, closed to proper occlusion. Retrusion – 1/16 inch, protrusion – 1/4 inch. 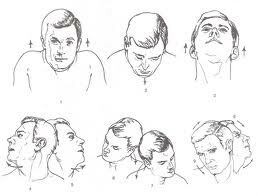 Rotation through a vertical or transverse axis – 1/4 inch from midline. NEUTRAL POSITION – Head Up and Chin In. When we nod the head in “Yes” we seesaw the skull on atlas joint, in a rocking motion. If the head is rotated from side to side in “No”, it is turned on the pivot joint between the atlas and axis, as a rotating platform. 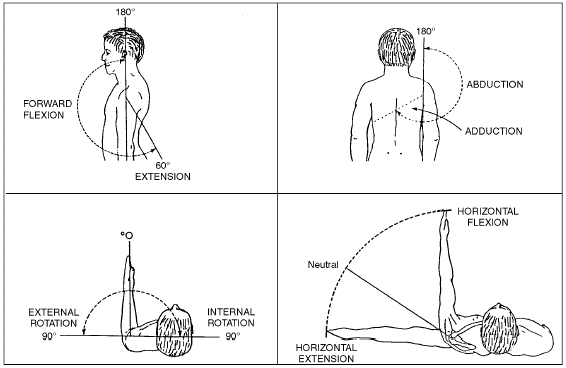 NEUTRAL POSITION – Spine in Perpendicular Position. Motion in spine is hard to evaluate because the cervical and lumbar regions are freely movable, while thoracic spine is limited. Forward bending is extremely variable, and depends upon general physique, exercise, laxity or contracture of muscles, etc. NEUTRAL POSITION – arm at side with humerus in lateral plane of body and elbow extended. Since arm is pointing to 6 o’clock on a circle, the starting point is one of 180°. The carrying angle of the elbow is the angle at the long axis of the humerus and the long axis of the forearm. The average is about 15º. The radius may be the main bone of forearm and wrist, just above distal end of the radius, and on inner side of the bone, there is an articular surface – sigmoid cavity. This is for articulation with distal end of ulna. The distal portion of ulna also has a lateral articular facet. This joint permits radius to rotate around ulna through an arc of about 140º, hand and fibrocartilage moving with radius. 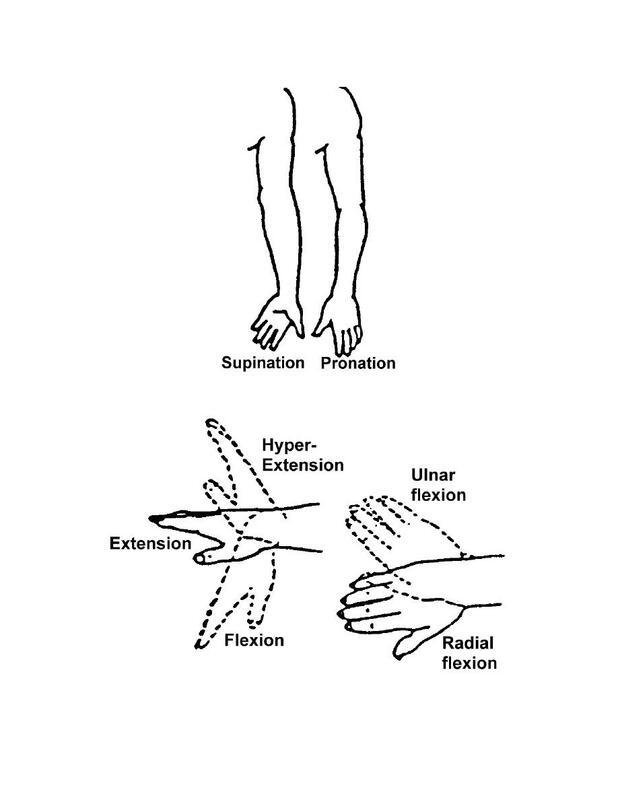 Abduction and adduction of wrist occur almost entirely at radio-carpal joint. Flexion and extension are largely at this joint. 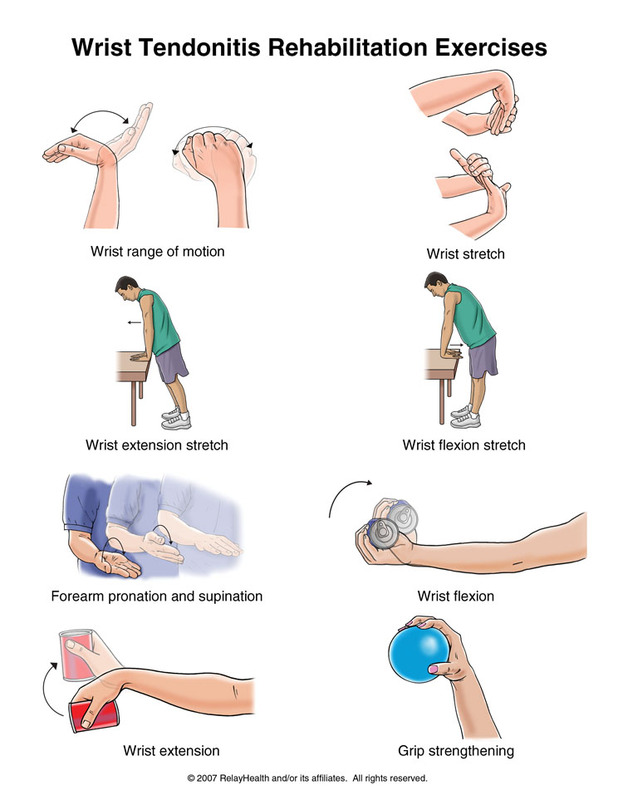 The position of strength in the hand is one of moderate dorsiflexion. As the angle of dorsiflexion is lost, the flexion power of the fingers is diminished. NEUTRAL POSITION – thumb alongside forefinger and extended. 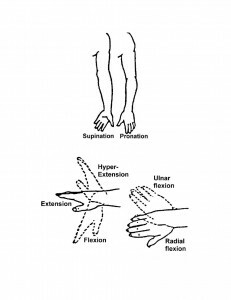 The trapezium-metacarpal joint is part of the wrist, but its motions are, within limits, independent of the wrist. Abduction of thumb is measured by taking the distance from proximal joint of index finger to tip of thumb in abduction and comparing it with opposite side. One main function of the hand is grasping power between thumb and fingers. Loss of motion, particularly in thumb, is extremely important. In the fingers, the metacarpophalangeal joint plays an important role. Limitation of motion affects the entire finger in normal closure of hand. Thank you SO much! This will help me not only with my ‘normal’ students, but also with the developmentally disabled group I recently started working with. They so clearly demonstrate to me the effects of long term improper sitting – for that is all many have them have done most of their lives! For many of them to lay out flat on their back is HUGE work! When they stand back up – they are a little taller and straighter than before, though! (-: I can’t wait till the program gets the yoga balls, and we begin some gentle supported extension work of the spine! They just think it is fun – I see ‘opening’ of new spaces for them! Thanks, Cora! This is great. Every Yoga teacher should read this and understand it thoroughly. I’ve never been a fan of classifying students as “beginning,” “intermediate” or “advanced” based on their mobility. Some people’s bony structures will never allow their bodies to do certain poses because when bone hits bone, there’s no more movement possible. Lotus Pose is a great example. Depending on the depth and orientation of one’s hip sockets, the femur bone may never be able to rotate to the position necessary to perform Lotus. Likewise, some people’s humerus bones will hit their scapulae at an angle that precludes straight arms. Some schools of Yoga prohibit these people from joining intermediate or advanced classes. Never mind that these folks could be enlightened and wouldn’t be allowed in an advanced class because they can’t do backbends with straight arms!